Summer is the time to enjoy the outdoors, friends and family. 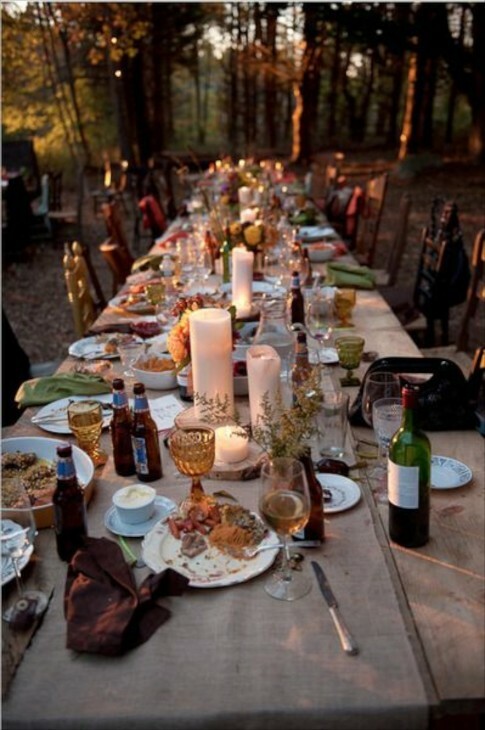 It is a time when we are able to easily go more casual, and entertaining is about enjoying food and company. We still like to set the mood with a table that makes our family, friends and guest feel welcome, enjoying the effort the host has put forth. 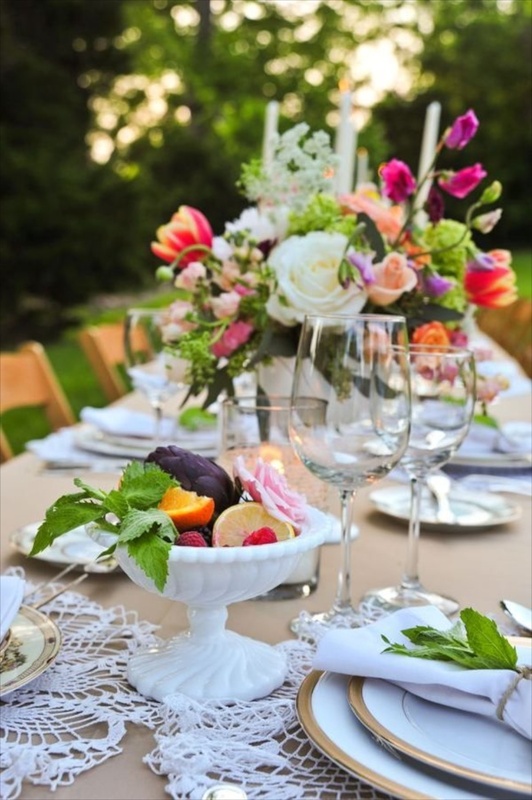 Table decor can be simple or complex depending on your mood or the event and in any case there are many ways to make your tables look wonderful, and a lot of it can be done with minimal expense. 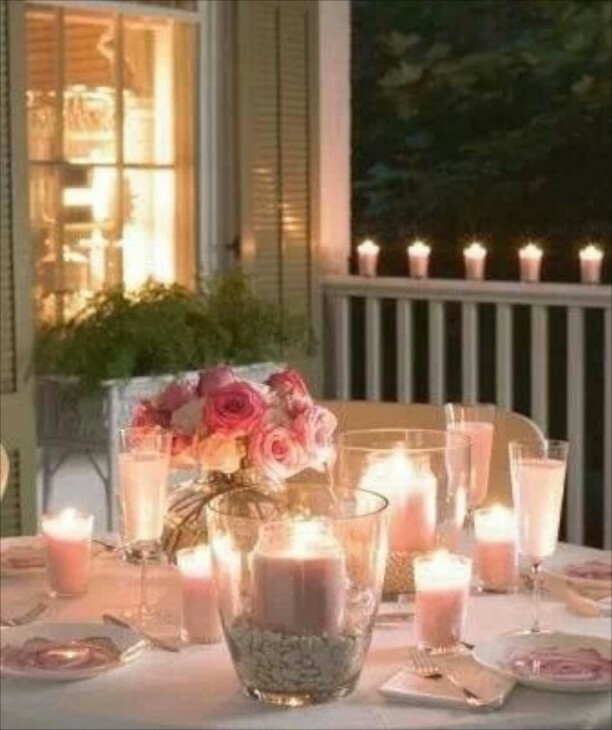 Candles make any table special. Preparing the table for your soiree is a creative process, and above all it should be fun! Let’s look at some more photos of summer tablescapes. 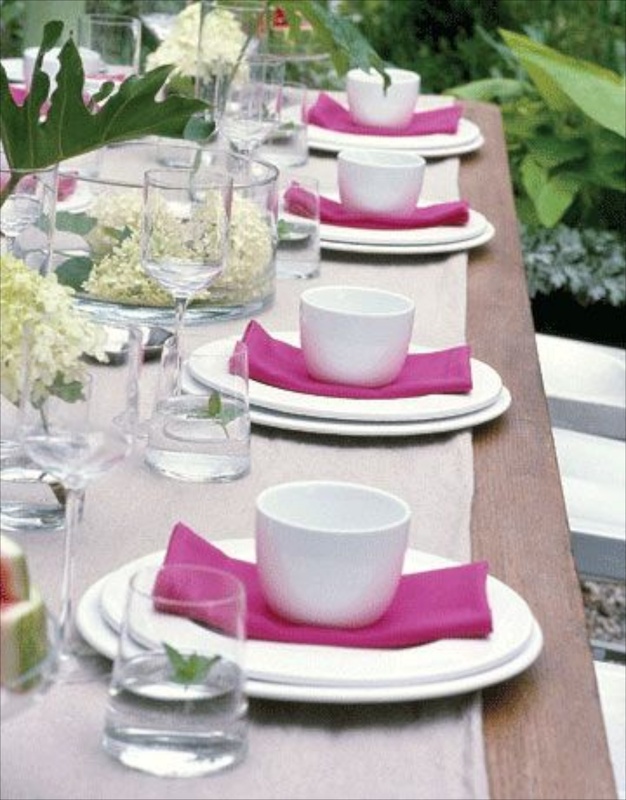 White dishes take on an entirely different attitude with the simple addition of brightly colored napkins. 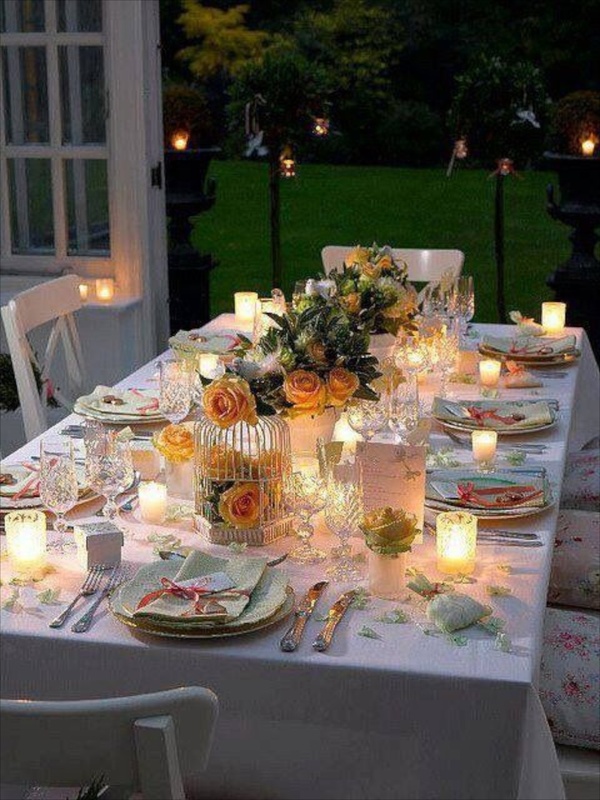 A few flowers along the length of the table and you are set to go. 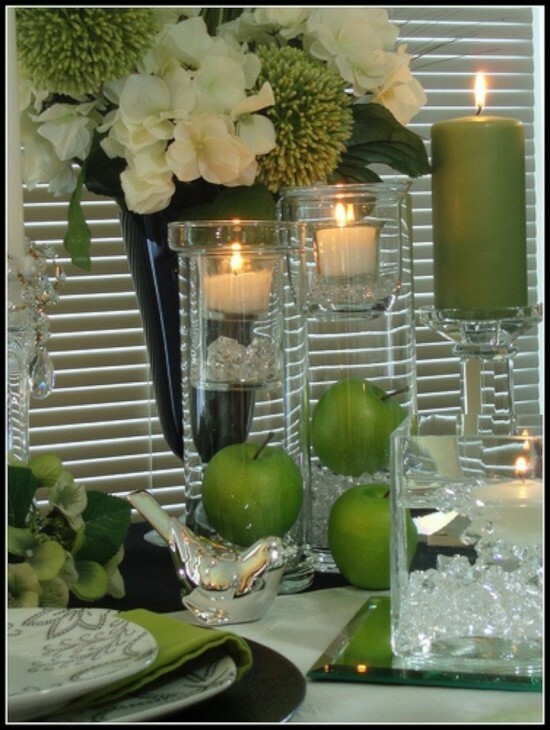 I love the use of green with with white and a dash of black with clear crystal. The little bit of silver adds a dose of casual elegance. 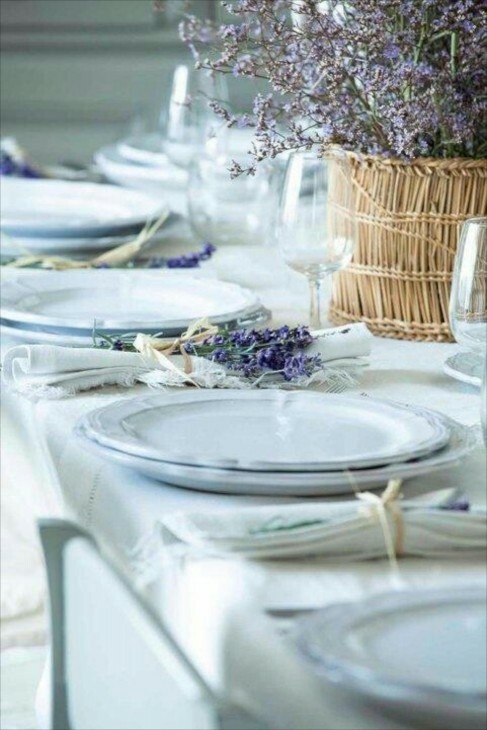 Raffia tied lavender around the silverware , and lavender in a basket brings white tableware up a huge notch. So easy yet lovely. You could substitute Baby’s Breath, a daisy, rose or any small “bunch”, and you’re done. Another example of white easily amplified, here with a single hydrangea blossom and a linen napkin. Almost any solid colored napkin, or perhaps a wide stripe would look good with this. 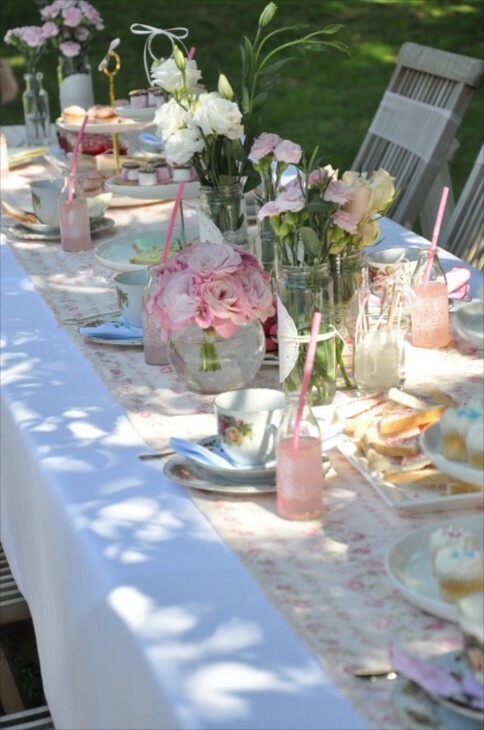 A shabby chic – cottage look achieved by a table runner down the middle over a white tablecloth, the addition of flowers is repurposed glass jars and sweet teacups. It surely says summer….. I love to play rustic against sophisticated. In this case a rough wood table topped with sleek and shiny silver, and crystal glass. Bright sunflowers add a bright, summery finish. 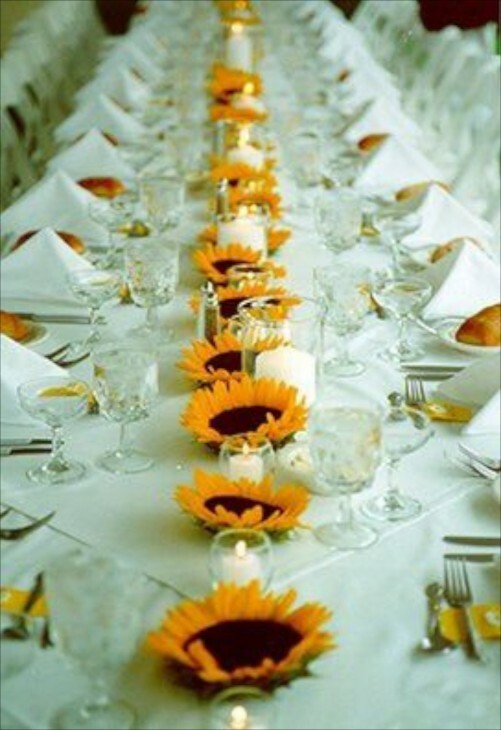 Big impact using just sunflower heads, providing a substantial presence and color for an all white table. White candles in between add the romantic touch. 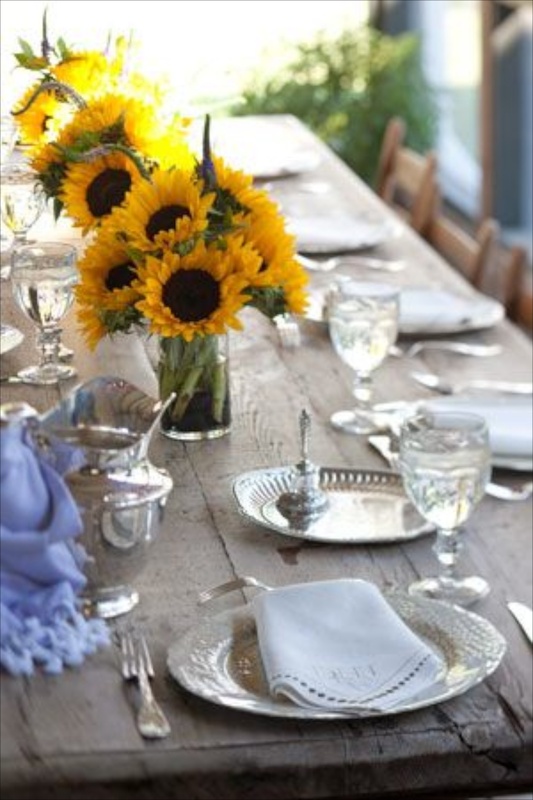 One bunch of sunflowers can do a long table. 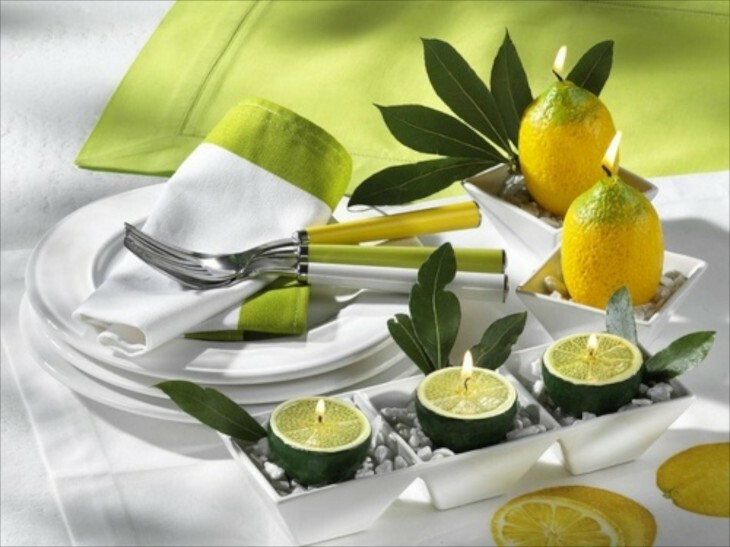 If you come across some cute candles like these lemon and lime ones, use them as your inspiration to complete you table setting. It only takes small pops of color to add interest. 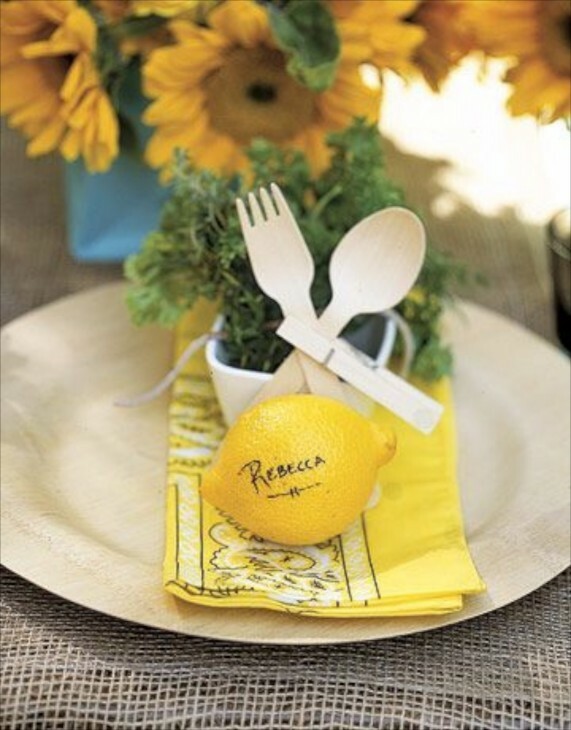 I love, love how something as simple as using a lemon for a place marker adds whimsy and playfulness to this table. How cute is the clothespin holding together the utensils? The yellow continues with the addition of sunflowers and yellow bandana napkins. 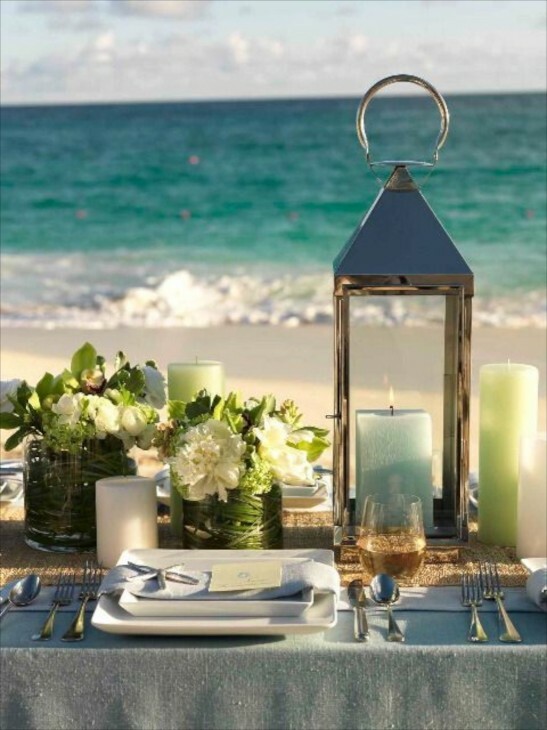 Placing shells into a container and a few scattered along a table runner is all you need for a beach themed meal. 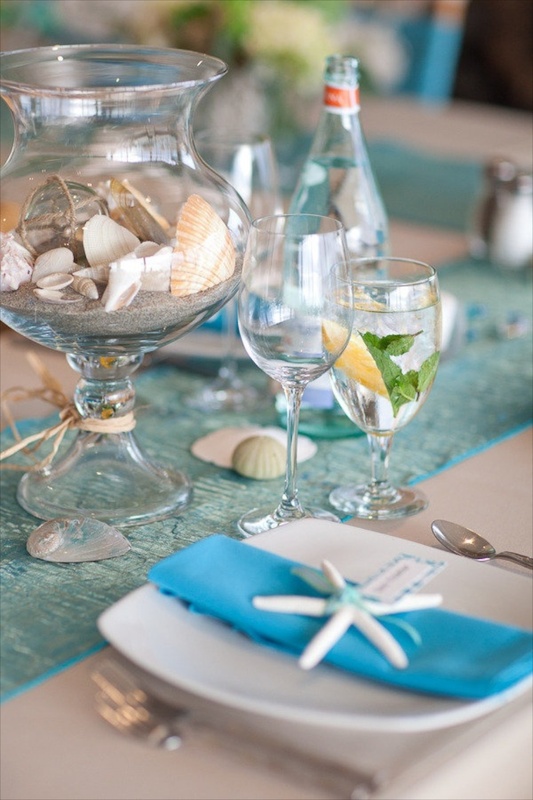 Placing a starfish or even another shell on the napkin completes the table setting. 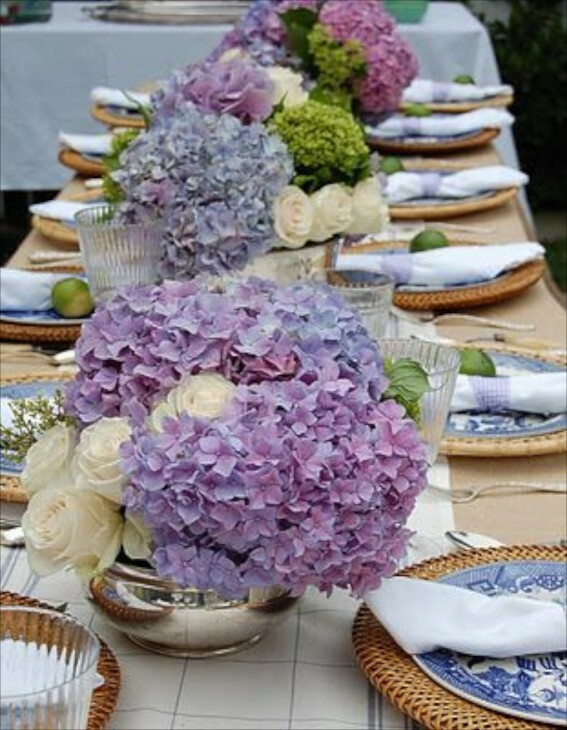 Hydrangeas makes it so easy to add floral impact to a table. 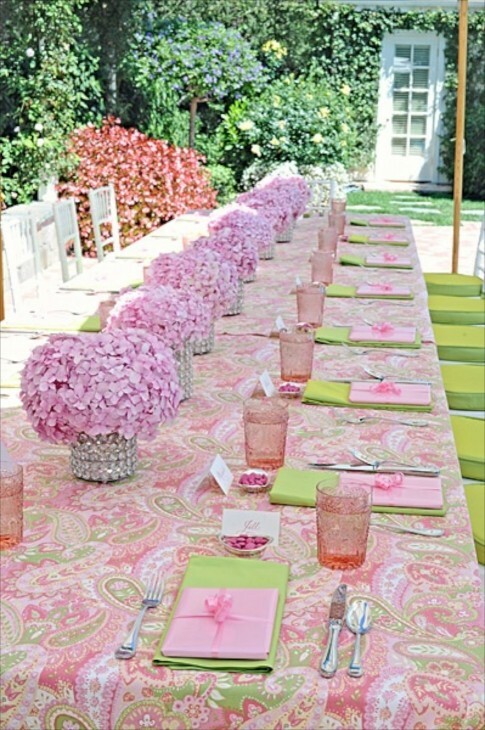 The arrangements placed on top of a brightly colored paisley tablecloth in the same pink hue as the flowers is so summery. The pop of white in the place cards is a nice touch to this tables cape. 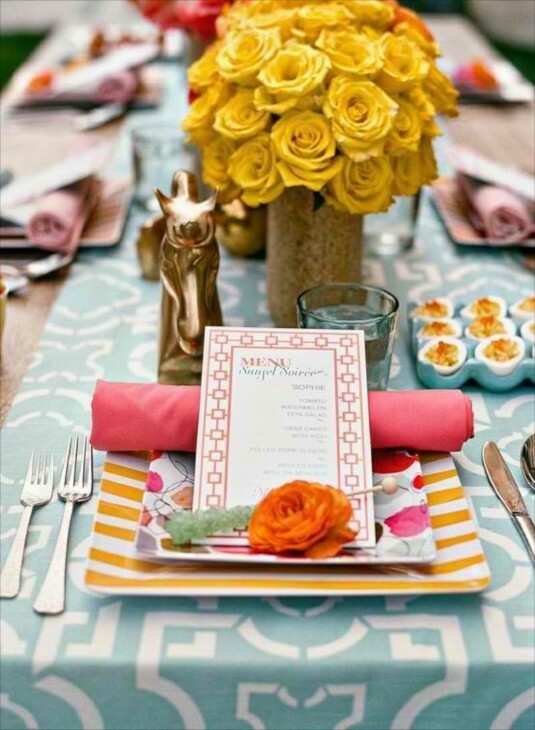 This table setting is all about bright color. In addition to the brightly color flowers, fruit, vegetables and herbs add even more color. I think the choice of a taupe colored tablecloth is perfect, allowing the gold rimmed edging on the plates to add a beautiful design element. Milk glass and white casual tatting placemats keeps it from being too fussy, as does the twine tied napkins with a sprig of herb. Hydrangeas just say summer, and we see them here again but with roses , and where rattan chargers lend a casual balance to the silver flower vessels. 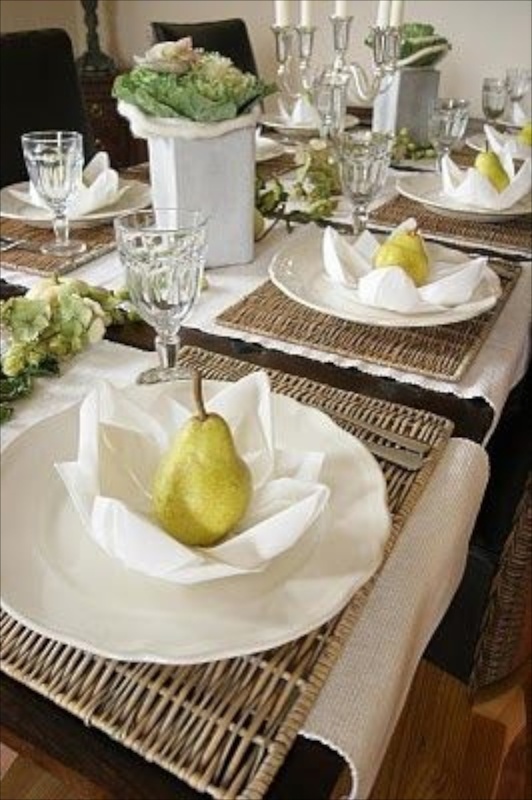 Pears atop fancy folded napkins is all it takes to add fun and interest to a tables cape. Plates sit on top of reed placemats and ornamental cabbage picks up the greenish yellow color theme. Don’t be afraid to use a lot of color and pattern if you like it. That is what makes decorating for a party or dinner so much fun….it is temporary and is the perfect chance to go bold where you have never gone bold before! I like menu cards, but they are not required. Here they took a horse statue to use as table decor. Look around your home and use what you have. 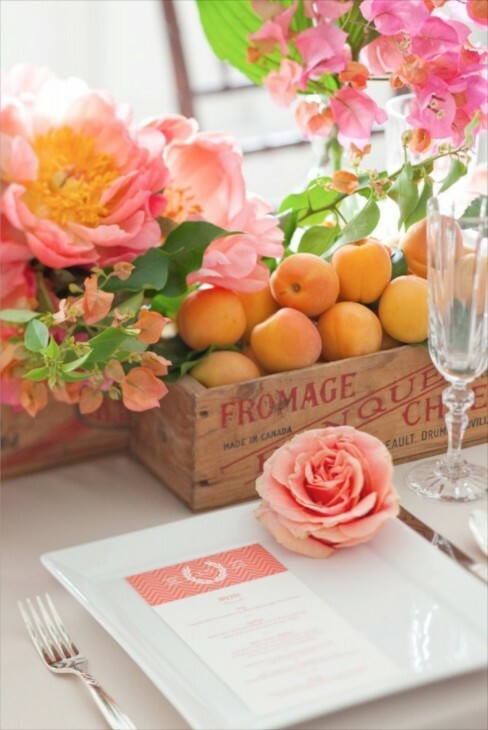 Fruit in a box or bowl or even placed down the middle of the table, is so easy and is also an inexpensive way to add color to a table. It is even better if you can mix it up with a few flowers. Here both are used and are set in vintage wood boxes. Again, look around, and use what you have. 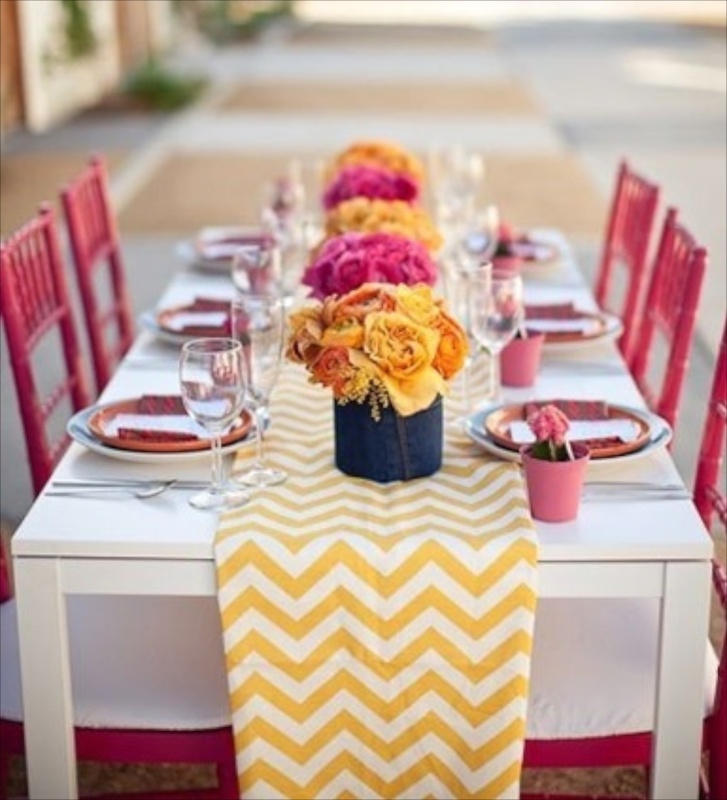 If you have chairs that are painted, use them to add the big color statement to your tables cape. Use a complimentary color for the table and go from there. 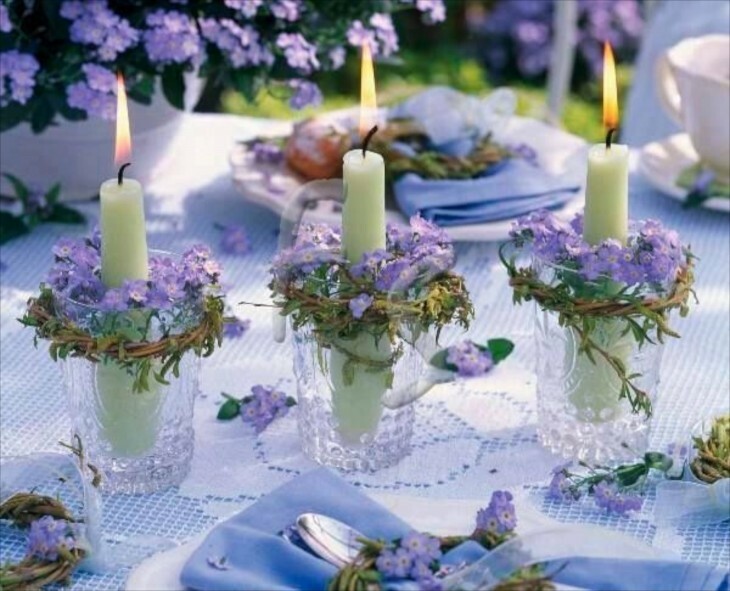 Using tumblers or even glass jars rimmed with sprigs of flowers or vines with a candle placed inside looks elegant and sophisticated. 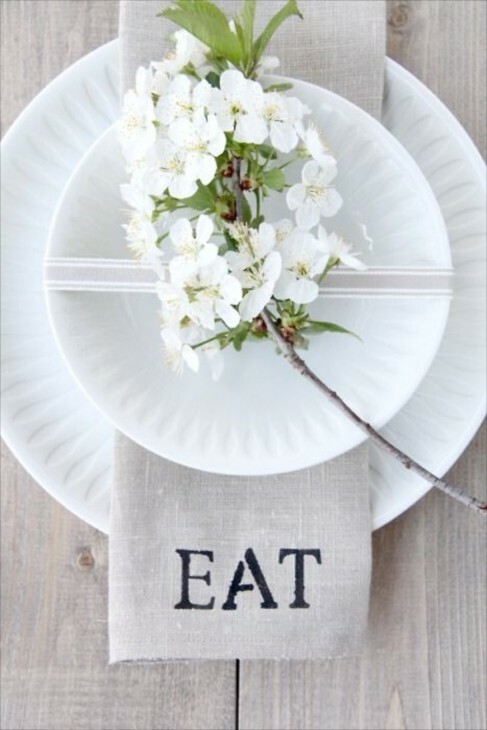 This is a lovely example of what you can do with handily available tableware. 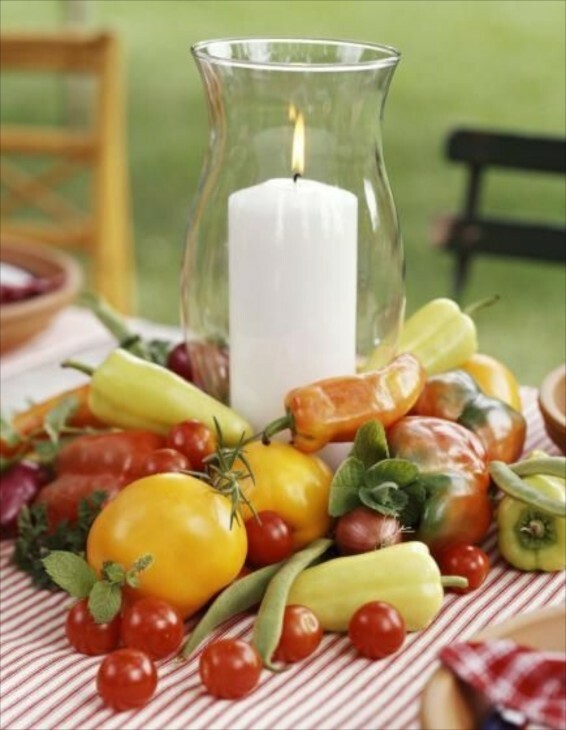 If you are having a spur of the moment gathering, take some of the summer produce you probably have and simply arrange it around a hurricane light or lantern and that is all a table needs. It really is about friendship and enjoying the meal. As a designer I especially enjoy the opportunity of setting a table for family or friends. Every time I go to Home Goods I say to myself, ooooh, wouldn’t this be pretty for a party table. It is a fun and creative opportunity without the usually much long term commitment that redoing your decor requires. Just remember to have fun with it. Some of my favorite books are those I have collected with tablescape themes. Over the years of entertaining, I have often spent more time on the table decor than the meal! 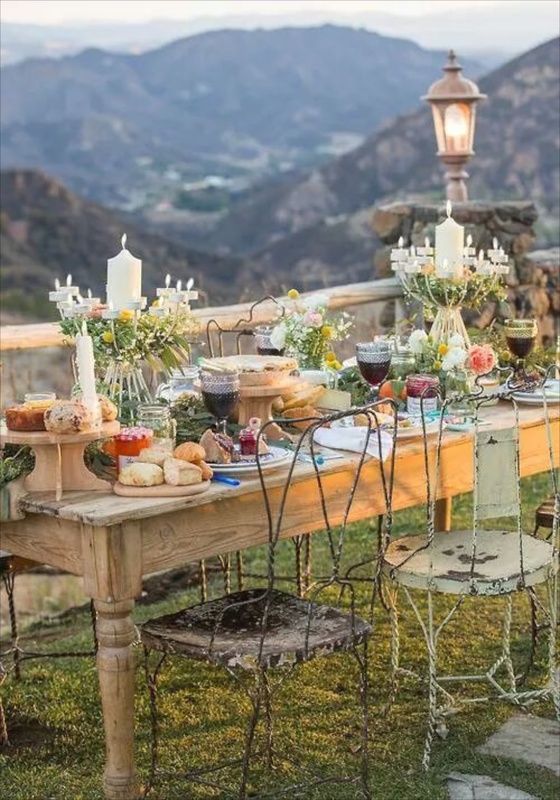 I love the example above with the candles in daylight and the mountain scape!! 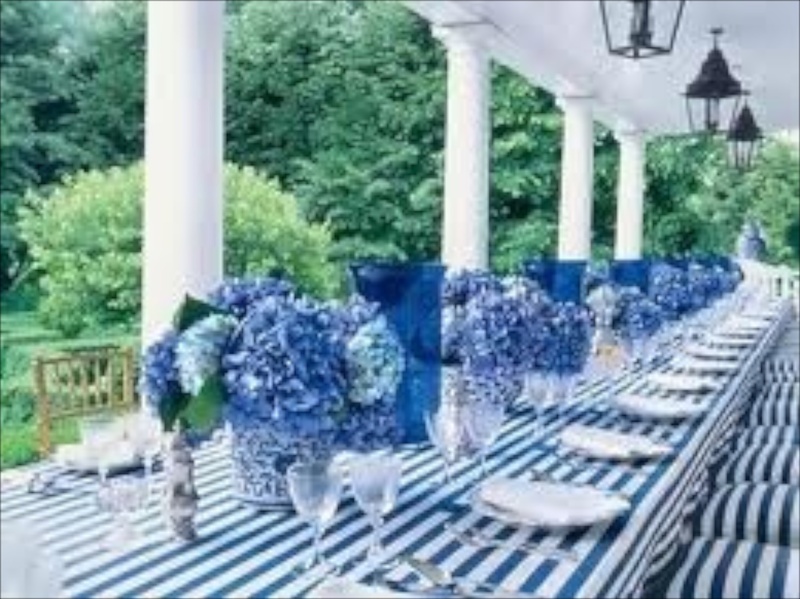 Also love the blue and white table and several others. I am a big fan of unusual items on the table such as a sugar scuttle, bone dish, personal gifts for guests, artistic napkins and napkin rings, name plates and organic decor. This brought lots of cheer to my day! I know what you mean about spending time on table decor, although I have gotten better about it. I LOVE napkin rings and plan on doing a post on some unusual ones. I love to watch the wedding planner shows to see what they come up with for the tables. Some are too over the top, but some are geniuses at it. Loved the lemon and lime table. The candles were so cute. I think that was a favorite for me. I like a crisp color scheme in summer….makes one feel cooler. I received a gift of wax full sized lemon candles and I like them so much I haven’t burned them, I just use them for decor. Oh! You inspire me so! It never occurred to me to use several shorter table runners from side to side, instead of running them down the length of the table, as in your ‘pear’ photo. Brilliant! Must run now & make 4 runners for the dining room! Thank you for many wonderful new ideas! 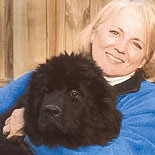 BTW, one of my Newfy’ s was named Hannah Amaryllis Higginbottom. Her last name says it all, doesn’t it? Well thank you! I actually prefer the side to side table runners compared to placemats. With placemats there never seems to be a place for the water or wine glass, and I prefer the look, although I have enough placemats to last a lifetime! I have made several side to sides from old tablecloths that have good edges but the middle is shot. Quick hem and you’re done. 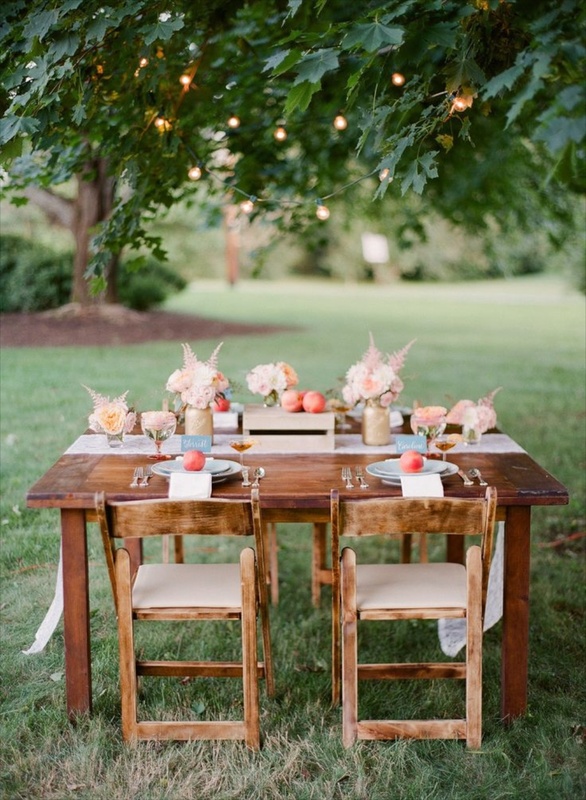 I love setting a table according to the seasons, and what great ideas I have gotten from you! I also have always loved candles – must be the romantic in me. I have to confess that I have become a huge fan of the Luminera candles that Disney has patented. They are incredibly realistic. They have timers, and the D batteries last for at least 3 months. I now never have to worry about a certain Newfy girl taking one out with her tail, or grandkids running into a table and knocking a real candle over. Thanks for starting my day in such a great way. I have the same candles and they are amazing aren’t they? I was dubious at first. A couple of mine are on timers and one even has a remote! How lazy has candle lighting become, LOL? I am a fan of candles and have many large hurricane lanterns that I use, mostly in winter.